Transferred to the University Archives of the University of Pennsylvania in 1997 and 1999. Donation of 0.5 cubic feet was received from Westminster Theological Seminary in 2009. The Presbyterian Medical Center originated as a charitable institution named the Presbyterian Hospital in Philadelphia. Early in 1871, Rev. Ephraim D. Saunders, a Presbyterian minister, offered a two-and-a-half-acre property at 39th Street and Powelton Avenue to the Philadelphia Presbyterian Alliance for use as a hospital in memory of his son Courtland, who had been killed in service during the Civil War in September 1862. The Church accepted the offer and stipulated a mission for the future hospital as “to provide for the needs of the sick and disabled regardless of race, color or creed.” On March 25, 1871, the Supreme Court of Pennsylvania approved the hospital charter and a board of trustees was formed on April 3, the same year. 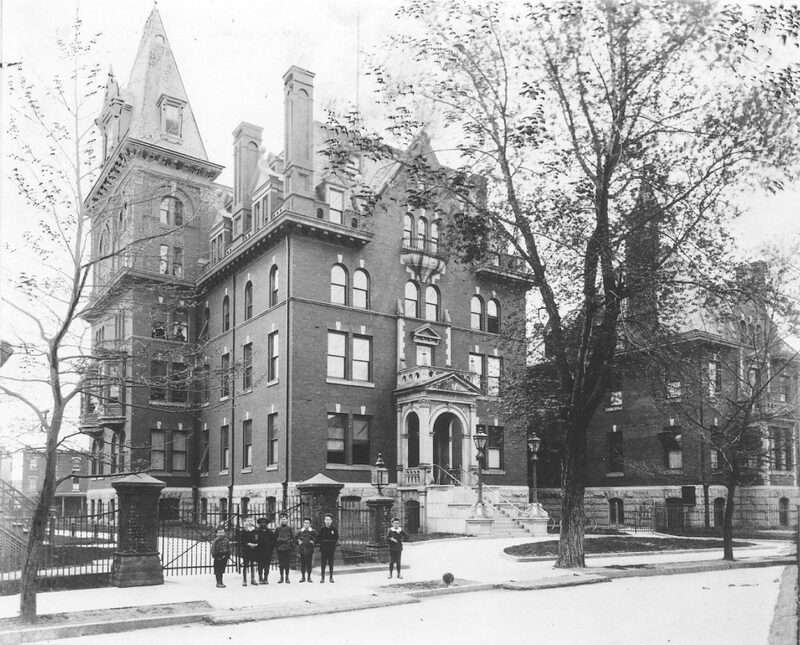 On July 1, 1872, the Hospital with a 45-bed facility admitted its first patient. The Hospital underwent great changes in the past over 130 years. It established its own training school for nurses as early as 1889. To meet the rapidly growing demand for its service, the Hospital expanded continually in its physical facilities throughout the twentieth century and became, by the 1990s, a modern medical center with a facility of over 300 beds located on approximately 16.5 acres. It has been a pioneer in a number of medical programs and home to several specialized patient-care services, including the Philadelphia Heart Institute and the Scheie Eye Institute. In nursing training, the Hospital established a second school of a different kind–the Presbyterian School of Practical Nursing–in 1964 to solve the shortage of bed-side nursing personnel. A major development, however, has been in its institutional relations. The Hospital developed close relations with the University of Pennsylvania in its early years as many of its staff held teaching positions at the Penn Medical School. The relationship was consolidated when the Hospital became formally affiliated with Penn in 1965 and changed its name to “Presbyterian-University of Pennsylvania Medical Center” on July 1 that year. While keeping the original mission of the Presbyterian Hospital, the Center now allowed the University of Pennsylvania to nominate one third of its Board of Trustees and was in a better position to serve as a clinical resource for the training of Penn Medical School students. On January 1, 1989, the Center was renamed as the Presbyterian Medical Center of Philadelphia. As modern medicine and hospital industry further advanced, with the organization of health system increasingly more sophisticated and the gap between the needs and resources widening, both the Center and the University saw the merit of a closer relationship. On June 30, 1995, after much negotiation between the two sides, the Presbyterian Medical Center of Philadelphia merged with the University of Pennsylvania Health System. The Center has since become part of the University of Pennsylvania Health System. In addition to providing comprehensive care to residents of Philadelphia, the Penn Presbyterian Medical Center is one of the major bases for the training of medical students at the University of Pennsylvania. All members of its staff now hold faculty appointments at the Penn School of Medicine. The Collection documents the history of the Presbyterian Medical Center of Philadelphia since its founding in 1871. The Board of Trustees and Committees series includes Board of Trustees minutes from 1871 all the way to 1995, the year the Center merged with Penn, as well as minutes, correspondence and other documents of various committees. In addition, it includes minutes and correspondence of the Presbyterian Medical Center Foundation, the predecessor of the current Presbyterian Foundation for Philadelphia which was at one time a holding company of the Presbyterian Medical Center, from 1983 to 1989. The Annual Report series includes a complete set of the Presbyterian Hospital’s annual report from 1871 to 1983 (the bound copy ending with the year of 1959). There are duplicate copies for many years in either bound or paper cover volumes. The series of the Administrative files runs from 1871 to 1997. Included in this series are sub-groups such as Buildings and property, Contracts, leases and agreements, general administrative correspondence filed chronologically, the Cupp Pavilion dedication file, Departmental meeting file, Ethic Committee file, Financial file, HotelHospital program file, Institutional Review Board file, the Joint Commission on Accreditation of Healthcare Organizations (JACHO) and Joint Commission on Accreditation of Hospital (JCAH) files, Medical Education Committee and Medical Executive Committee files, Medical Quality Assurance Committee file, files of the Medical Staff and its Executive Committee, correspondence concerning nursing and nursing programs, Quarterly Medical Staff Meeting file, Research Council minutes, Research funding files, and a general staff file. The series of Departments includes departmental records and files from such major sources as the Cardio-vascular Research Lab, the Administrator of the Department of Medicine (Robert Hardin), Department of Medicine, Department of Nursing Education and Research, Department of Nursing Services, Emergency Department, Medical Auxiliary, Nursing School, Alumni Association of the Nursing School, Public Relations Department, Research Administration, Research Institute, and Scheie Eye Institute. The series of the History research files includes material collected by researchers regarding the history of the Presbyterian Hospital, files of the History Committee, notes and extracts made by researchers, drafts and notes by Lillian Brunner for her intended book with her relevant correspondence, and transcripts of an oral history project conducted in 1995 (tapes unseen). The Reference materials series consists of material of two categories–the sub-series of Disorder, diseases and treatments is related to discussion of various specific medical topics; the other group is of more general nature on various health care topics such as HMO, nutrition and smoking. The Publications series includes all major publications of the Presbyterian Medical Center, among them the Bulletin, Center Post, Nursing School yearbook serial, Presby News, and Presby View. Also included are some old collected physician article reprints and medical magazines, 1876-1912. All photographical records have been grouped in the series of Photographs, negatives, slides, etc. The sub-series of Photo prints has been arranged by subject while the negatives, slides and glass positives stay with their original index codes. Special notes have been attached to the end of the collection inventory to provide detailed information on any specific group of negatives, slides or glass positives. Included in this series are also two reels of film. The Scrap7books series consists of clippings from a number of scrapbooks and albums, covering the period from 1949 to 1975. The Audio and visual tapes series includes a song album recorded by the Nursing School student nurses’ choir as well as audio and video cassettes on various topics. The series of Paintings, posters, charts and other graphics includes acrylic and oil paintings, architectural sketches, charcoal drawings, charts used in discussion of merger with the University of Pennsylvania, and Montage posters related to PMC history and research interest. The Architectural drawings series consists of thirty-six reels of architectural plans as well as a couple of master utility plans. The Plaques series comprises a total of twenty-nine metal plaques collected from various hospital facilities or made in commemoration of special occasions. An itemizing note has been attached to the end of the inventory. Memorabilia items and medical instruments have been grouped as one series. It includes such major items as ceramic candle lamps, China Delft tiles donated by Harriet Carhart, Hospital seal press and seal images, nursing pins and pins issued on various special occasions, and three souvenirs from India. Medical instruments range from blood pressure gauge and other minor medical appliances, syringe and needles, containers of various kinds, to iron pestle and mortar. The nursing uniforms series includes uniforms and caps of various styles, covering the period from 1932 to 1987. See UPC 501 for Presbyterian Medical Center Ladies Aid Society Records, 1872 – 2002. See also http://www.nursing.upenn.edu/history/collections/pson.htm for information of the Presbyterian School of Nursing Records, 1871-1988, stored at the Center for the Study of the History of Nursing. 1952 Sept. – 1959 Jan.
1959 March – 1964 Dec.
1965 Jan. – 1966 Nov.
1985 Jan. – Sept., minutes and correspondence, etc. 1985 Oct. – Dec., minutes, correspondence, etc. 1986 Jan. – April, minutes, correspondence, etc. 1986 May-June, correspondence, reports, etc. 1986 Sept. – Oct., correspondence, etc. 1987 Oct.- 1988, correspondence, etc. ACGME (Accreditation Council for Graduate Medical Education), Residency Review Committee for Internal Medicine, visit of 1987 Feb.
Air Plus Air Fluidized Therapy System, operating manual, n.d. Correspondence, 1984-1988, loan of paintings from Philadelphia Museum of Art to Scheie Institute, facility inspection, etc. Administrative Correspondence (including ribbon-cutting), 1979-1981 Oct. Administrative Correspondence (including ribbon-cutting), 1981 Nov. Administrative Correspondence (including ribbon-cutting), 1981 Dec. Administrative Correspondence (including ribbon-cutting), 1982 Jan.
Committee correspondence, minutes, etc., 1981 April-Sept.
Committee correspondence, minutes, etc., 1981 Oct.-1982 Jan.
Department Head Meeting, agenda and minutes, 1990 Aug. – 1992 Sept., Agenda and minutes, 1990 Aug. – 1992 Sept.
Study of the internal medicine residency program for PMC by Amicus, Inc., 1989 Dec. Eye Institute presentation by Harold G. Scheie, 1969 Feb.
Hospital Policy Manual, 1991-1992, Building services and Administrative procedures, etc. “Proposal to Presbyterian Medical Center for a Public Relations/Lobbying Campaign” by the REACH Communications Specialist, Inc.
Mock survey of the special care units, 1986, material for review including minutes of the Operations Quality Assurance Committee and the Nurse Management Meeting, 1984-1985, etc. Agenda and minutes, 1990 July – Sept. Agenda and minutes, 1990 Oct. – Dec. Agenda and minutes, 1991 July – Sept. Agenda and minutes, 1991 Oct. – Dec. Agenda and minutes, 1992 July – Sept. Agenda and minutes, 1992 Oct. – Dec. Agenda and minutes, 1993 July- Dec. Agenda and minutes, 1994 July- Sept.
Minutes and reports, 1990 July-Dec.
Medical Record Committee, 1990, minutes, etc. Correspondence, from Dr. John Girvin, n.d. Agenda and minutes, 1989 July – Sept. Agenda and minutes, 1989 Oct. – Dec. Payroll ledger, 1925 June–1927 Sept. Payroll ledger, 1929 Jan.–1930 Nov. Payroll ledger, 1938 Dec.–1939 Nov.
Professional Advisory Committee, minutes, 1989 Nov. – 1990 Feb.
Programs, three, Employee service recognition dinner, 1972 May 16; a capping ceremony of the School of Nursing, 1975 February 2; and a memorial service for Annie Lloyd Davies, 1984 Oct.
Radiology Foundation of P-UPMC, corporate records, 1982, and annual meeting, 1983 Nov.
Redevelopment Authority of the City of Philadelphia, agreement with the Presbyterian-University of Pennsylvania Medical Center on a purchase for redevelopment, 1981 Oct.
Unexpended restricted gifts to the campaign fund, list, 1954 Oct.
Dog experiments, operative notebook, 1954 July- 1954 Nov.
Dog experiments, operative notebook, 1955 Feb. – 195 Jan.
Dog experiments, operative notebook, 1957 March -1959 Feb.
Prayers, counseling service, and Job quota, n.d. Basic Critical Care 10-day Course, 1991 Sept. – Oct. Basic ECG interpretation course, 1991 Oct.
Critical care course, 1992 Sept.-Oct.
SVO 2 monitoring, 1992 Dec.
Assistant Nurse Managers Meeting, 1988-1992 Jan. Blood Transfusion Committee, minutes and agenda, 1988-1989 Feb.
Department Head Meeting, minutes, 1991 Feb. – 1992 Jan. Patient Care Associate Committee, minutes, 1990-1992 Jan. Patient Education Committee, 1989-1992 Jan. Section 3.1, Unit Specific Nursing Policies and Procedures, Standard of Care, etc. Nursing Opportunities Meeting, report, 1971 Jan.
Paper by John H. Moore, Jr., et al, on carcinoma of the thyroid, n.d.
Room schedule, 1986 Sept.- Oct.
Rules for the Nurses’ Home, 1920s? 1995-1996, correspondence, history, expert opinions, etc. School of Practical Nursing, brochure, n.d. Transcripts, parts 4-5, covering the period of 1983 July-1984 Dec.
Brochure “More options in nursing,” n.d.
Vol. 1, No. 4, 1974 Sept.
Vol. 1, No. 5, 1974 Oct./Nov. Vol. 2, No. 3, 1976 Jan.
Vol. 5, No. 4, 1978 Sept.- Oct.
Vol. 5, No. 5, 1978 Nov.- Dec.
Vol. 6, No. 4, 1979 July-Aug.
Vol. 6, No. 5, 1979 Sept.-Oct.
Vol. 6, No. 6, 1979 Nov. -Dec.
Vol. 7, No. 1, 1980 Jan. – Feb.
Vol. 7, No. 5, 1980 Sept.-Oct.
Vol. 7, No. 6, 1980 Nov.-Dec.
Vol. 8, No. 1, 1981 Jan.-Feb.
Vol. 8, No. 5, 1981 Sept.-Oct.
Vol. 9, No. 3, 1982 July-August. Insights, Vol. 6, No. 1, 1979 Nov.
View, Vol. 1, No. 3, n.d.
1992 construction, 33 interior, by Vantage View, Inc.
1992 construction, 77 exterior, by Vantage View, Inc.
Chapel in the New Presbyterian Hospital, n.d.
General exteriors, three, 1 print, 1 positive and 1 negative transparencies, n.d.
Atwood, John, with fire lieutenant, n.d.
Hospice, photographs and slides, n.d.
HotelHospital, 3 x 5″, n.d.
Class of early 1960s ? Pictures for place identifying contest, n.d.
Plaque inventory, photographs with notes in five sections, n.d.
LPN (Licensed Practical Nurse) program, n.d.
HotelHospital, negatives and slides, n.d. Negatives, four, including one of Dr. J. Roderick Kitchell (cardiologist), 1966-? Courtland Center for Continuing Care, n.d.
emergency ambulance equipment, charts of home care and HMO, etc., five, n.d. Ambulatory Services, Pavilion script, ca. 1970-1971? Architectural sketch of the hospital from the 39th Street and the Powelton Ave., n.d. Architectural sketch of the hospital’s new parking building, n.d.
Montage posters, three, re PMC history and research interest, n.d.
Planning report and transmittal letter, 1969 Nov.
21, “Furnished by Frances Hall Nevin and Mary Stewart Hodge,” n.d.
Commemorative account of Rev. Ephraim D. Saunders’ contribution to the founding of the Presbyterian Medical Center, printed on a parchment, n.d. Desk nameplate, “Miss Mary E. Brown, Director of Nurses,” n.d.
French tile, 3″x 6″, tan scroll work on beige background, “brought from France by the Wannamakers [sic],” ca. 1888? Hospital seal, 2 1/2″ round metal, inscribed “Presbyterian Hospital in Philadelphia, 1871; Presbyterian–University of Pennsylvania Medical Center.” 1980? Metal badge/pin with ribbon, inscribed “Presbyterian Hospital in Philadelphia,” in small turquoise leather case, tooled in gold, with gold satin and velvet lining, ca. 2″x 4″. 1940s? Nursing commemorative stamp sheet, 4 cent denomination, n.d.
Gradle-Schiutz tonometer (for measuring eye pressure) in a small black leather case, 2 1/4″ x 5 1/2″, n.d.
Hypodermic needles, stainless, in a small box, 1954 Jan.